There are 58 million Hispanic consumers in the U.S., and over half of them are bilingual in English and Spanish. Yet many brands are still questioning the power of bilingual marketing strategies. The question should no longer ask how effective English, Spanish or “Spanglish” marketing is, but rather how to implement these languages to effectively communicate culturally relevant messages and content. Approximately 90% of U.S. born Hispanics spoke English in 2013, and this growing statistic has been frequently used as justification for not utilizing Spanish content and media channels. However, a marketing strategy integrating the Spanish language, Hispanic characters, symbols and relevant messaging amplifies brand reach and loyalty. For example, almost three quarters of Hispanics lived in household where Spanish was spoken in 2013, allowing grandparents, parents and children to communicate and reinforce the recall of your brand regardless of language fluency. 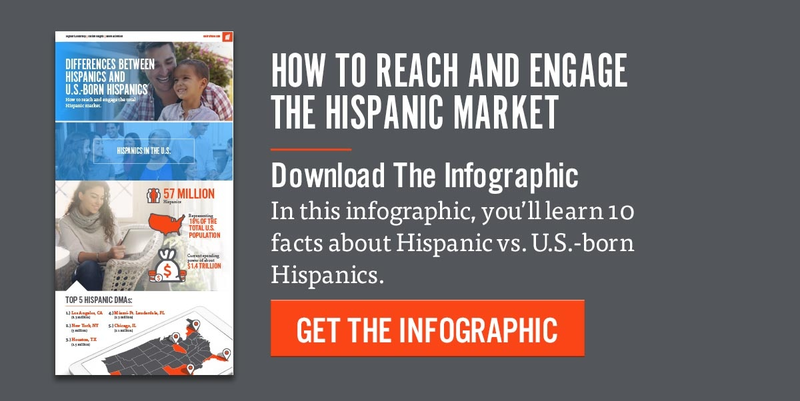 Other opposing notions toward marketing in Spanish include the decreasing number of Hispanic immigrants arriving to the U.S., and the increasing number of Hispanics consuming news via English media channels. Nonetheless, almost all Hispanic populations have stated that it is essential to them that future generations speak Spanish. As television remains a predominant medium for all members of the Hispanic household, applying Spanish-only content will still allow consumers to connect with your brand on popular channels such as Univision, Telemundo, Azteca and Galavision. A study, pubished in AdWeek, found Hispanics’ peak attention levels were 32% higher, and 44% more engaged, during Telemundo’s Spanish-language broadcast of the Confederations Cup than Fox’s English-language broadcast. It’s essential to have a multicultural expert supervising your Hispanic marketing campaigns to avoid any inauthentic or offensive depictions. Constantly placing Hispanic characters in secondary roles, abruptly introducing them as a token person of color, or using the Spanish language in a condescending or ridiculing manner is likely to have negative implications on their purchase and recommendation intentions. According to a 2015 study, 70% of Hispanics have affirmed the importance of a company’s website to be culturally relevant, with 88% of Hispanics stating their increased attention for ads incorporating aspects of Hispanic culture. As you strategize your Hispanic marketing for Q3 and Q4 2018, remember to recruit the necessary cultural and media expertise for optimal campaign performance.